After nine years of interest rates below 1%, it seems imminent that the Bank of England will announce a rise before long. As pay growth picks up and inflation hits its 2% target, a rate rise would – it is argued – ward off potential risks of inflation in the medium term. But another factor to bear in mind is that a rate rise could also have serious repercussions for people's mental health. A large portion of the UK population have high, possibly unsustainable, levels of debt and a higher interest rate is likely to increase the burden of repaying some of that debt. It will therefore likely increase their levels of mental distress. 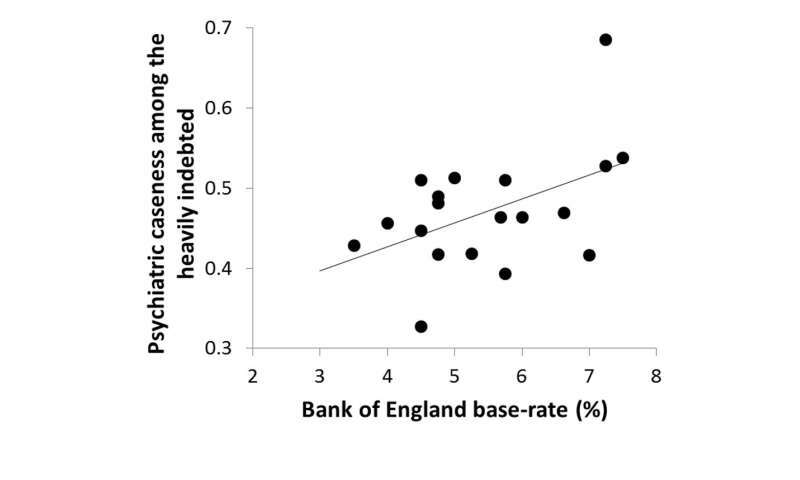 In recent research that colleagues and I published in the Journal of Affective Disorders, we explored how Bank of England interest rate changes from 1995 to 2008 influenced people's mental health. What we found is that for each 1% increase in interest rates, there was a 2.6% increase in the incidence of mental health issues experienced by those heavily indebted. Although there is always some margin for error in statistical estimates, this would translate to 20,000 additional cases of mental health difficulty in the UK. As well as the obvious health cost here, there is also a financial cost. 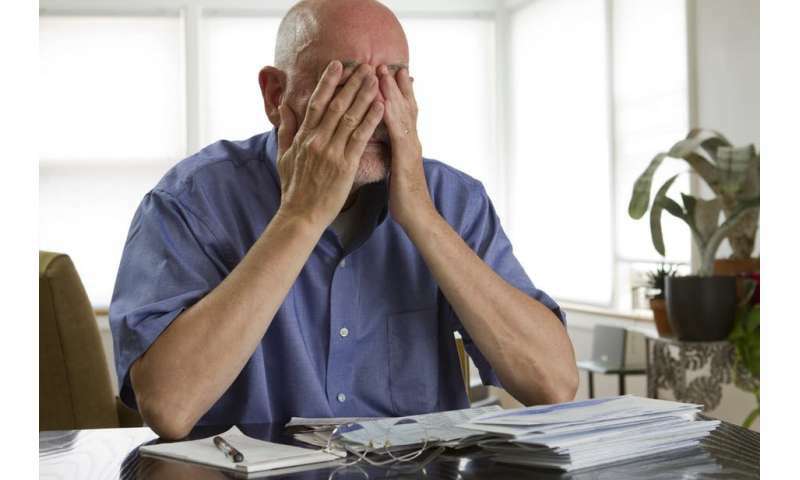 Since one case of mental health has been estimated to cost somewhere in the order of £8,000, in terms of absences from work and lost quality of life, this would have an overall cost to society of £156m. Although over-indebtedness is well known to be bad for people's mental health, our study is the first to show that there is a direct relationship between central bank interest rate decisions and mental health. This raises the question of whether central banks should also consider how their decisions influence population mental health. There has been a growing interest in using non-economic indicators to guide public policy, with the suggestion that more emphasis perhaps ought to be placed on psychological outcomes. Some economic objectives, such as economic growth and inflation, are often not strongly linked to changes in mental health and well-being. With regard to monetary policy, some have argued that since unemployment is considerably worse for mental health than inflation, greater emphasis should be placed on reducing unemployment than maintaining price stability. Plus, income growth has limited effects on general well-being when compared to other factors such as health, relationships, and personality, and it has been shown that the avoidance of income losses matters much more for well-being than the pursuit of income gains. But the Bank of England's objective is purely economic. Namely "to maintain price stability", as defined by the government's 2% inflation target. And, subject to that, to support the government's economic policies, including those for growth and employment. It is generally agreed that ensuring price stability is the best way that central banks can support long-term economic growth, as it fosters greater confidence in the economy and encourages investment. Price stability is generally maintained by ensuring that the money supply increases at the same rate as economic growth or output. If money supply increases faster than output, then it is believed that this will result in inflation. A central bank may increase money supply at a faster rate than real output, to inject more demand into an economy. This can generate higher economic growth and lower the rate of unemployment, which can be helpful during times of recession. Of course, a decision not to increase rates may cost the economy much more than the loss from increased mental health cases of the £156m estimated earlier. An increase in inflation expectations may in the longer term, for example, lower overall economic confidence and discourage investment. Plus, having low interest rates for too long may encourage people to take on levels of debt that become unsustainable when rates are higher. Rates that were too low for too long to obtain economic objectives may themselves have been a contributor to the present state of indebtedness. The central bank's objectives do not necessarily need to change to anything but economic ones. But our research does clearly illustrate that the pursuit of economic objectives will likely have painful repercussions for individuals. These should be acknowledged, forewarned, and where possible countered. For example, this may take the form of helping people avert excessive indebtedness, strong public health warnings around indebtedness levels, and ensuring adequate mental health support for those that have become heavily indebted. There is also an alternative approach to conducting monetary policy that may meet economic objectives, yet still help protect people's mental health. Over the last decade, central banks tried to maintain price stability by injecting trillions into financial markets by buying up bonds and assets so as to increase the money supply. 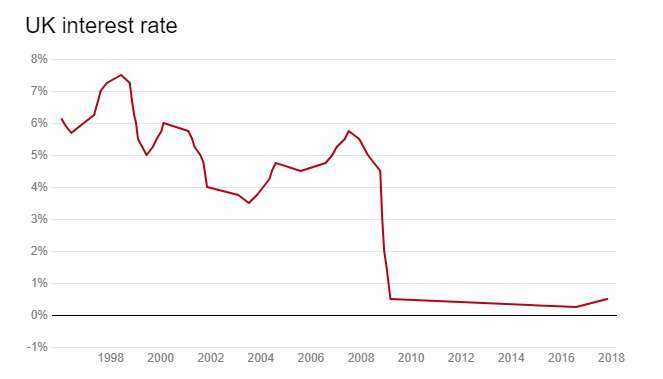 This quantitative easing approach has been criticised because it had very little impact on the economy since it didn't give regular people more money in their pocket to spend. Giving money directly to individuals might have been more effective. It would likely also have helped decrease people's debt burden, and therefore the pressures on mental health. Mental health issues are often more debilitating than many physical health issues yet the available resources to help those in psychological difficulty remain vastly insufficient. Not only do we need comprehensive strategies for helping people cope with psychological difficulties directly, but it is important to recognise that mental health links to the economy. We must therefore create an economic environment that is supportive to people's mental health.